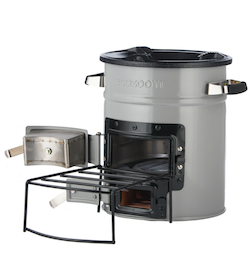 EcoZoom rocket stoves are perfect for outdoor cooking, camping and emergency preparedness. EcoZoom was founded in Portland, Oregon and currently has its headquarters in Nairobi, Kenya. Their clean burning, portable wood and charcoal powered cookstoves are a mainstay for many Kenyan communities where they provide a clean alternative to smoky, dangerous cook fires. In North America, people love EcoZoom stoves for their efficiency and portability, which make outdoor cooking a breeze. * EcoZoom Versa models can burn charcoal while Dura models cannot, see products for more details. 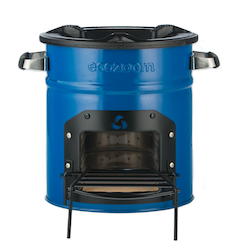 EcoZoom rocket stoves can burn wood, biomass, and charcoal*, making them an eco-friendly and versatile solution for everything from camping to emergency preparedness. There is no lengthy setup or preparation required as with barbecue grills - just light your fire inside the insulated chamber and you're ready to cook. The stoves have an impressive lifespan and will last over 5 years with regular daily use. If used occasionally for camping or kept on hand for emergency preparedness, they will last for virtually a lifetime. EcoZoom also offers cooking accessories for their stoves, including a convenient carrying bag, pre-seasoned cast iron cookware, and a power ring that wraps around the base of a pot to increase heat efficiency by an additional 25%.